Last weekend, my husband was removing a takeout menu from our front stoop when he mused “why don’t we have wings for the game on Sunday.” When I asked him if he wanted to buy or make them, he initially said buy, but then we both decided that this is something we could easily make-with the right recipe, of course. I did a little searching on the internet and came across an Alton Brown recipe that looked pretty straightforward and had great reviews. I’m a little weird about using online recipes. I have my “go to” sites that I trust, which include Epicurious and The Food Network. On the other hand, I’m totally weirded out by things like Allrecipes and Cooks.com. Don’t ask because I wouldn’t be able to give you a reasonable informed rationale behind my thoughts. Back to the wings. Even though I think Alton Brown is a total weirdo, I’ve made a few of his recipes before and they seem to be on point–something about the science behind his recipes seems to work. So I figured I’d check out his wing recipe and see what it was all about. Place a 6-quart saucepan with a steamer basket and 1-inch of water in the bottom, over high heat, cover and bring to a boil. The funny thing about using the steamer basket is the fact that we were cleaning out the basement the previous day and my husband picked up the steamer basket and asked what the heck it was. I don’t think I’ve used it in the four years we’ve lived in our current house and I used it the day after he noticed it. Remove the tips of the wings and discard or save for making stock (i.e. put in your freezer with the best intentions, forget about it and then throw it away during a freezer-cleaning frenzy.) Using kitchen shears, or a knife, separate the wings at the joint. This takes a little practice to get just right. When you cut it in the right place, it will cut through very easily. If it’s not cutting easily, you probably need to adjust your cut. Place the wings into the steamer basket, cover, reduce the heat to medium and steam for 10 minutes. Remove the wings from the basket and carefully pat dry. Lay the wings out on a cooling rack set in a half sheet pan lined with paper towels and place in the refrigerator for 1 hour. This step is incredibly important because it fully dries out the chicken. Dryness is important because it helps the skin get nice and crispy in the oven. Replace the paper towels with parchment paper or a silpat if you realized that you ran out of parchment paper earlier. 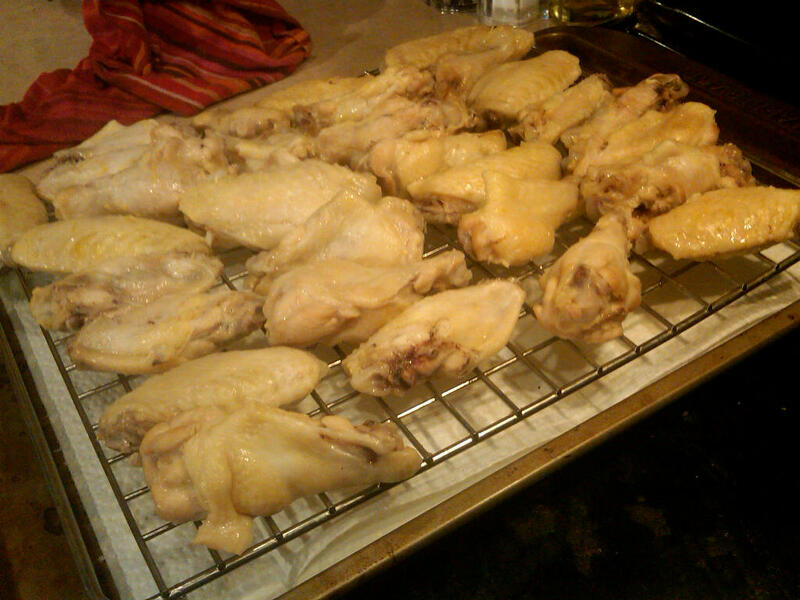 Parchment is best though, because cleaning a silpat after cooking these wings on it is a real pain. Roast on the middle rack of the oven for 20 minutes. Turn the wings over and cook another 20 minutes or until meat is cooked through and the skin is golden brown. While the chicken is roasting, melt the butter in a small bowl along with the garlic. Pour this along with hot sauce, honey and salt into a bowl large enough to hold all of the chicken and stir to combine. Remove the wings from the oven and transfer to the bowl and toss with the sauce. Serve warm with celery and house made blue cheese dressing from Linvilla Orchards. But only if you’re fancy like us! Oh, and enjoy while watching the Eagles win, of course. 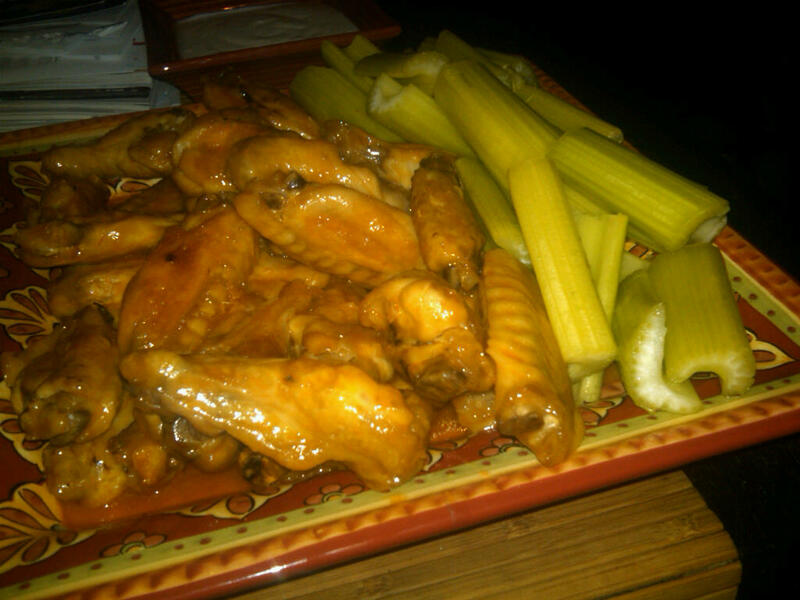 These wings were excellent! The roasting provided a perfect crispness without the added fat of your traditional deep-fried wings. It also allowed for us to enjoy the juicy meat with just a perfect amount of crunch. Although there were a few steps, the overall dish was super easy and the basic preparation could be used with a variety of different sauces. Sounds like a great recipe, and your instructions are terrific. I’m with you on your trust level with certain recipe sites; your trusted/mistrusted ones mirror mine. We are having wings “in spirit” today: I bought Buffalo-seasoned chicken sausages from Martin’s at the Reading Terminal Market. Spicy, with blue cheese in the mix. Might do a carrot/celery slaw on the side.